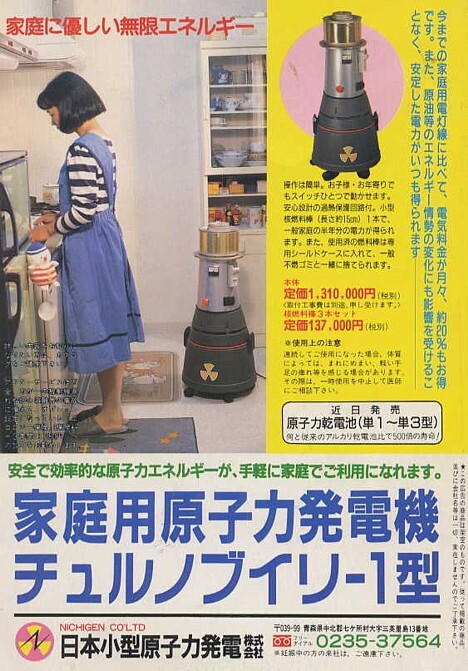 This spoof advertisement from the mid-1980s shows an imaginary home power system called the Chernobyl Household Nuclear Generator. Here is a loose translation. Reduce your monthly electric bill by 80% and enjoy a constant, stable supply of energy free from the fluctuations in supply that affect the oil market. A single, user-friendly activation switch makes the Chernobyl Household Nuclear Power Generator simple to operate, even for children and the elderly. One small nuclear fuel rod (about 15 cm long) generates enough electricity to support the average household for six months. To dispose of a spent fuel rod, simply insert it into its special shielded case and discard it along with ordinary non-combustible household waste. When using the power generator with direct current, people near the device may on rare occasions experience dizziness or a tingling sensation in the hands or feet. If you experience such conditions, temporarily discontinue use and consult a physician. Safe, efficient nuclear power is now readily available for use in your home. Nihon Shogata Genshiryoku Hatsuden, K.K. It has to be a joke ! In the end it says that leaking might be a problem ! In no ways will anyone allow this to be sold.. used .. forget commercialized ! This is a joke. There is a disclaimer at the right bottom (runs vertically) saying that everything here is purely fictional and that none of the product or the company exists. Nice. There is a warning written there asking pregnant women to stay away from the company that is selling these. I love this line: "To dispose of a spent fuel rod, simply insert it into its special shielded case and discard it along with ordinary non-combustible household waste." You should check your facts. The reactors at Chernobyl were ??????? ??????? ???????? ????????? types -- RBMK. Everyone knew these reactors were fundamentally unsound because of the physics, moderator, positive void coefficient, coolant loop, and most importantly, lack of containment building because of the size of the reactor. In fact, this reactor design was banned in the US in 1950. Why did they build them in the USSR? Easy: the reactor design is for "dual-use." To acquire Pu-239, needed for modern nuclear weapons. The RBMK allowed the fuel rods to be removed for separation of the plutonium during the short time window it was accessible (neutron poisons and other changes made it unusable after longer of operation.) The machinery to do this prevented the containment structure. As such, no one would ever suggest Chernobyl was a model reactor. lol It looks like a space heater. I wonder if it keeps the room warm. We just need a beta- or alpha-decay radionuclide with negligible gammas. This would have to have a lot of decay heat to do this as an RTG (radioisotope thermoelectric generator - as used on spacecraft and remote locations for beacons, and on the ocean floor to power surveillance equipment, etc. ), but there should be alternatives � and some of the heat would be used directly for water, home heating, etc. Hi Jim, I went to your site -- it's nice to see I'm not the only person who thinks Linear No-Threshold is a joke. Those ex-Soviet RTGs produced only a few amperes of current, but used fuel pucks with a surface temperature of hundreds of degrees F and a radiation flux of several hundred R/hour. Want to become rich, serve your fellow mankind. Develop a home size neuclear power generator for for single family homes, the home will have to change first as to its power requirements, must be converted to DC voltage, all lights to be LED lights to consume less power. Cooking surfaces also changed, heating and cooling of the home to be provided by the Daiken system, AC converted to DC, seemes to work great, get on the band wagon all you inventors out there. The heart of the system has a battery back up system as everything is dc voltage, the generator need only run long enough to charge the battery, when the batteries are low the generator takes up the slack and recharges battery when home demand has gone down. I am not an engineer of electronics, TV's ad sound systems all run at reduced voltages, down to I assume is dc volts. Can you build a AC 120 volt battery? I know DC volt batteries are common thru-out the world. Our governments are holding us back to provide profit for the energy companies, put a stop to it and free us from the grip of these people. Japundit » I Want One of These!